In Durham, a city that sparkles with more fantastic gluten-free options than you might expect, Joie de Vegan positively shines. From cakes to brownies to tarts to seasonal treats, everything from this bakery is gluten-free, vegan, and downright delicious. 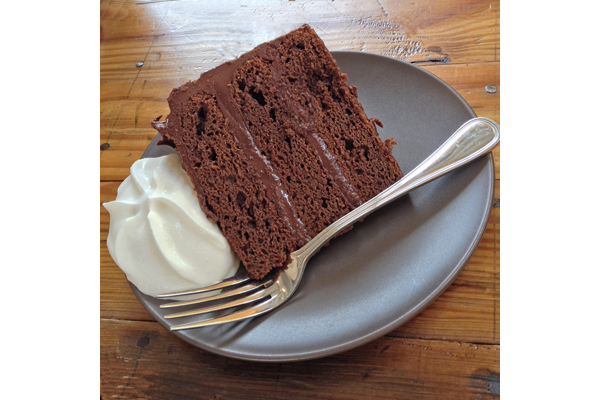 With its carefully procured ingredients, impeccable gluten-free baking standards, and delightfully inventive recipes, Joie de Vegan is a must for any Durham-area lover of sweets. Owner and baker Christiane Voisin comes from a family of French gourmets and accomplished bakers and chefs. Though she grew up baking both family recipes and classics from The Joy of Cooking, she turned her attention to non-traditional flours and sweeteners when she learned that she suffered from several food allergies and sensitivities. As an adult, Christiane began to explore a plant-based diet and became adept at baking with gluten-free flours. Her desire to offer Triangle-area residents (Raleigh, Durham, and Chapel Hill) thoughtfully-made and consciously-sourced sweets inspired her to launch Joie de Vegan. Christiane bakes with a variety of flours, including oat flour, potato starch, and amaranth flour. A unique flour blend for each recipe means that all of her sweets take on a completely distinctive flavor and texture. 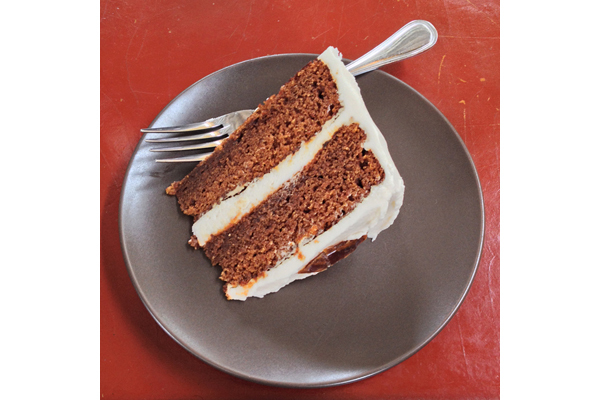 Joie de Vegan’s date cake, for instance, is more rich and moist than it has any right to be (trust me, this is a very good thing). The brownies are beautifully dense and warmly spiced with cinnamon, and the tart crust is perfectly flaky and buttery. While all of Joie de Vegan’s creations are certainly sweet, Christiane is careful to incorporate alternative sweeteners and lower sugar levels as much as possible. Coconut sugar and maple syrup feature prominently in many of her baked goods, and some, like her banana bread, are free of any added sugar. Since Joie de Vegan very much serves as a special order bakery as well, Christiane can easily accommodate requests for specific sweeteners and flours—even soy-free or corn-free. She also uses organic ingredients when possible, including in-season fruits and palm oil-free Nutiva shortening. It’s nearly impossible to resist Joie de Vegan’s year-round goodies, like the chocolate cake, date cake, and brownie (pictured above). Christiane’s seasonal treats, however, go above and beyond to make sure Triangle-area gluten-free eaters can always indulge in creative, delicious sweets. 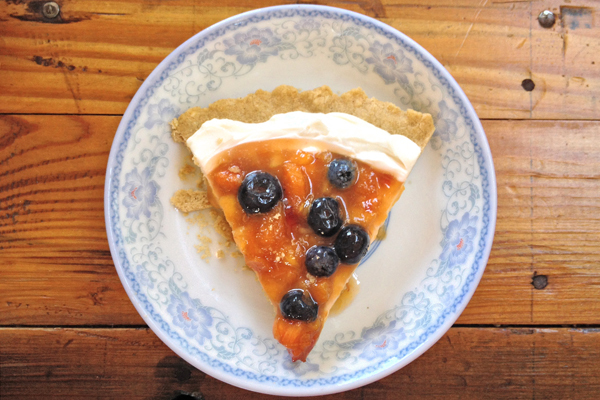 The blueberry peach tart was a lovely, fresh summer treat, and this fall, Joie de Vegan fans can look forward to mini pumpkin cheesecakes and pumpkin spice cake dusted with cinnamon. Where? Find Joie de Vegan goodies at Sage Café and Cocoa Cinnamon in Durham. We are partial to Cocoa Cinnamon for its great coffee and comfy environment: 420 West Geer Street, Durham, NC. 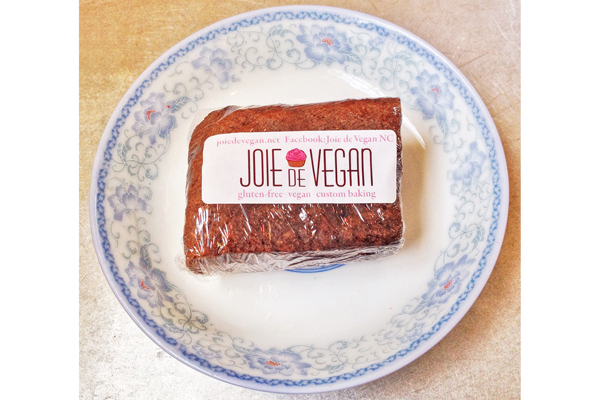 You can also special order cakes and other treats directly from Joie de Vegan by contacting Christiane Voisin here! These treats look delicious. Although I don’t have a gluten free diet, I appreciate the creativity. Need to make something with coconut flour soon! Yes! That’s one of my favorite aspects of gluten-free baked goods—creative ingredients. Love the flavor and density of coconut flour!